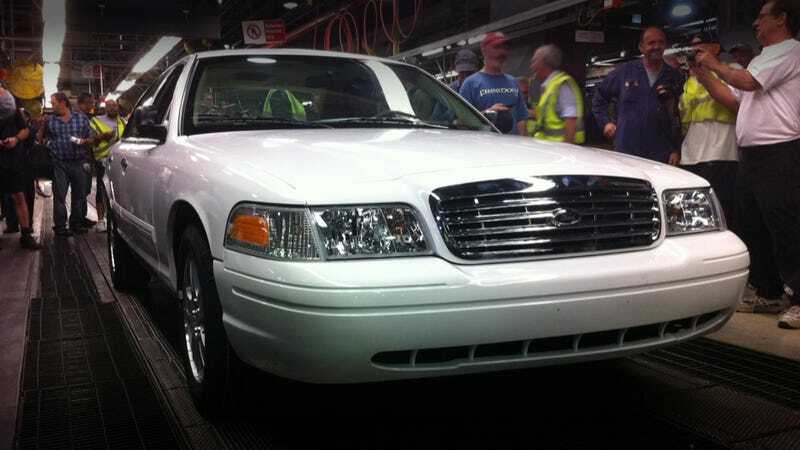 After 32 years in production, the last Ford Crown Victoria will roll off the assembly line today. It's a record that surpasses all other North American vehicles, including the Model T. Its final destination, however, isn't a museum in Detroit or a American collector. It's being sent to Saudi Arabia. Possibly the most profitable Ford car ever — thanks to bean-counting that denied it capital for major updates — Ford decided in 2009 that the cost of bringing the Panther platform to 21st-century standards and replacing its worn-out tooling was not worth the trouble. Its factory in St. Thomas, Ontario, has slowly wound down over the past few months; workers were sent home early Wednesday with the final five cars on the assembly line because they didn't have enough parts. The city is looking for potential new buyers for the plant, but most of the 1,200 workers will either have to move or quit. And with the death of the Crown Vic goes a whole slew of iconic vehicles from Ford's classic Police Interceptor — that will be replaced either by other automakers' cars or the new Taurus-based Ford Police Interceptor; to the New York City taxi cab — that will be replaced by either the Ford Transit Connect, a Nissan van (that our fearless leader hates) or some other random egg-shaped vehicle. Thanks to those employees, we know that the final Crown Victoria will be built for a Saudi Arabian customer, painted white with a tan interior and optional rear seat air conditioning. There's a lot that's sad about this, but for me, I think I'm most teary-eyed over the fact that when this four-door boat rolls onto the transport, destined for the far away Middle East, Ford's American dealers will be lacking a V8-powered sedan for the first time since 1932.